This past Friday, the U.S. Department of Labor reported that non-farm payrolls rose by 132,000 in May and that the unemployment rate held steady for the second month in a row at 4.5 percent. The payrolls report was cheered by Wall Street "experts" as an indication that the U.S. economy is healthy and that the bull market in equities is firmly intact. While we agree that the employment report was favorable and that the U.S. economy is still expanding, a closer look at the payrolls report suggests the best days might already be behind us. And, the fact that the U.S. economy grew at an annualized rate of only 0.7 percent during the first quarter of 2007 is certainly nothing to shout home about. In regards to the "strong" payrolls report, we note that the major contributors to May's employment gains came from the service sector where 135,000 jobs were created, and the government, which added 40,000 jobs. Meanwhile, 24,000 jobs were lost in the retail sector, while the important manufacturing sector witnessed a contraction of 18,000 jobs. Perhaps more importantly is the recent trend in employment. 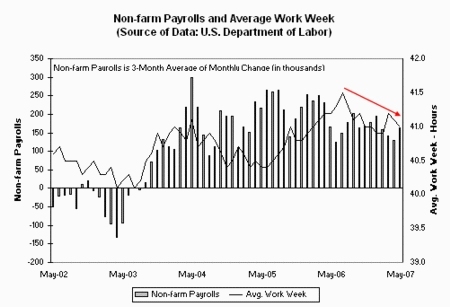 As you can see from the chart below, job creation has slowed considerably since March 2006. Even more important, the number of hours worked by manufacturing production workers has been trending significantly lower over the past year. Not surprisingly, we rarely (if ever) hear the major financial media or Wall Street "experts" comment on these trends. Another important employment indicator the Wall Street Cheerleaders failed to mention is the help-wanted index. This LEADING economic indicator, which is based on a survey of help-wanted advertising in major metropolitan newspapers, fell to its lowest level ever in May. And for those of you who might think, "Yeah, but most jobs are now advertised on the Internet," we suggest you think again — although many jobs are now placed on the Internet, newspaper ads still account for the bulk of employment ads. But, for those of you who decided to go by online jobs, be aware that jobs posted on the Internet declined 2 percent in May, from the prior month. By the way, the number of hours worked by manufacturing workers is also a LEADING economic indicator, as opposed to non-farm payroll growth and the unemployment rate, which are LAGGING indicators — employment doesn't begin to actually decline until after the economy enters a recession. So, you can choose to listen to the Wall Street "experts," who are generally trying to sell you something, or you can look at the real facts.